← Back to the Holy Land! 1. It memorializes the beautiful queen Esther whose bravery saved her people, and it commemorates the Jews’ deliverance from death and their victory over the jealous Haman. Esther’s story has always been one of the most beloved to me. 2. Everybody gets dressed up in costumes for Purim! 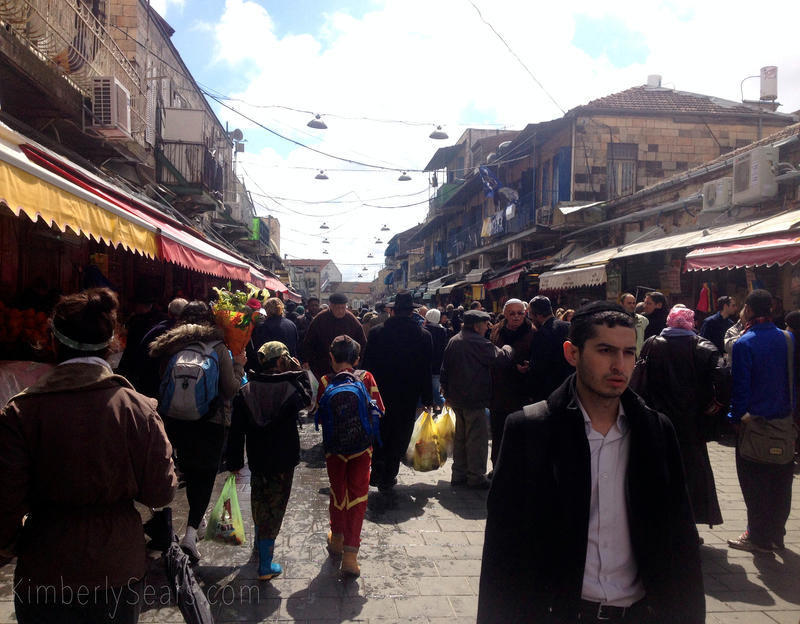 Two boys in costume, one dressed as Ironman and the other as an army soldier, walk down a street of Mahane Yehuda, the Jewish Market. Every year Purim costumes become a little more Americanized. Mark took this photo. The Book of Esther tells us that after the Jews were spared from death and their would-be exterminator Haman was slain, they instituted a holiday on the 13th and 14th days of the month of Adar (Purim is celebrated one day later, on the 14th and 15th, in walled cities such as Jerusalem). The first day of the holiday is observed as the fast of Esther to remember when Esther and all her people fasted before she dared come before the King Ahaseurus and make her request to him. The next day is the celebration of the Jews’ deliverance. When is the month of Adar, exactly? The Jewish calendar is lunar and lasts 354 days; in a normal non-leap year there are twelve months of 29 or 30 days. This means that Adar and Purim always fall in February or March. Because of the deliverance of the Jews from Haman, Adar is considered the happiest month of the Jewish calendar. Thus every leap year, when an extra month is added to the calendar, there is a second month of Adar. While accepted as scripture by Jews and Christians alike, the Book of Esther does not actually mention God’s name—not even once. But his hand can be seen in the story of the deliverance of Esther and her people and so it is said that he is “disguised” in the story. For that reason, many Jews celebrate Purim by donning disguises; instead of the usual somber black apparel, you can walk down the streets of West Jerusalem and see young people wearing Halloween-like costumes (and showing more skin than I’ve ever seen in the Holy Land). Purim tradition also includes attending synagogue to hear the reading of the scroll of Esther (the Megillah). Every time Haman’s name is read, everyone boos or shakes noisemakers to drown out the sound of Haman’s name. Another traditional Purim observance is drinking wine until you are so inebriated that can no longer distinguish between the phrases “Blessed is Mordecai” and “Cursed is Haman” (yes, really!). After all, if it were not for the banquet and the wine that Esther prepared for Haman and the king, the Jews would not have been saved! Mark and I loved spotting and snapping photos of everyone in their Purim costumes! Purim may well be the most lighthearted of all Jewish holidays. Chag sameach! 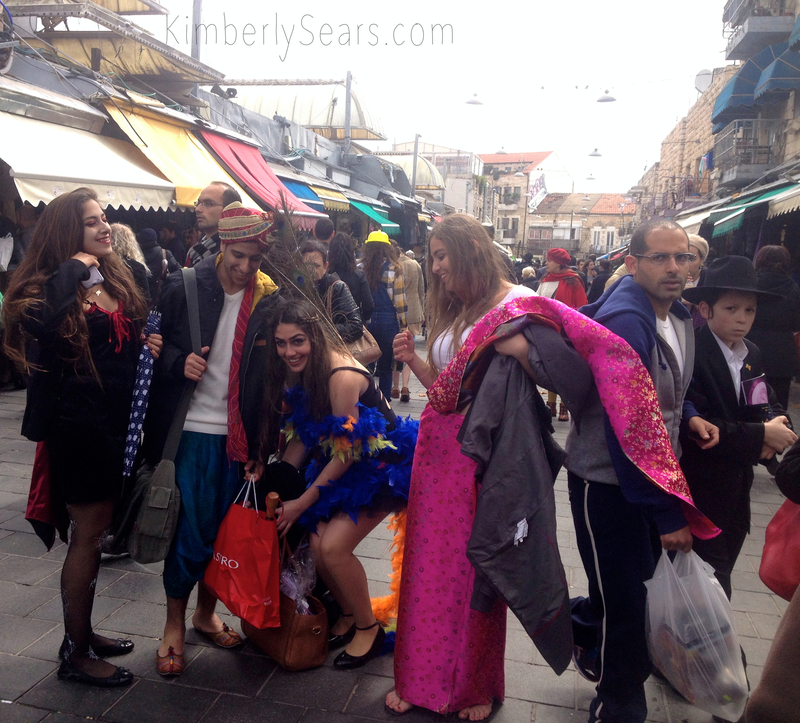 Israeli youth sport their none-too-conservative Purim costumes while a man and an Orthodox boy hurry past on a street in Mahane Yehuda.